Could the Milky Way be full of phantom, planet devouring black holes and billions of rogue, solitary planets? It looks that way. A recent simulation of black holes merger revealed that there could be literally hundreds of rogue black holes scattered across the Milky Way galaxy. Each one would weigh several thousand times the mass of the sun, so if they exist—why haven’t we identified them already? The research modeled "intermediate mass" black holes. There just one problem: no one even knows if these type of light suckers even exist. Astronomers do, however, have ample evidence that small black holes less than 100 solar masses are produced when giant stars explode. They also have evidence that “super-massive” black holes weighing the equivalent of millions to billions of solar masses sit at the heart of many galaxies, including the Milky Way. Theoreticians have predicted that globular clusters –- ancient, gravitationally bound groups of 100,000 to a million stars –- should contain a third class of black holes, referred to as intermediate mass black holes. But so far there have only been a couple controversial observations of these objects. The existence of intermediate-mass black holes have been proposed as a possible power source for ultra-luminous X ray sources. 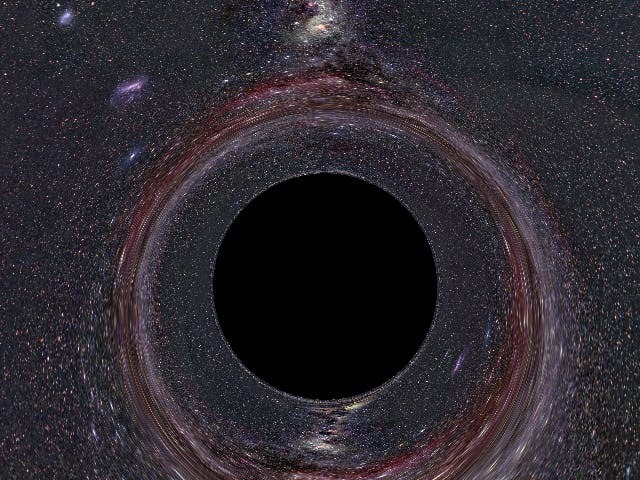 In the past couple years, scientists have succeeded in numerically simulating black hole mergers that incorporate Einstein’s theory of relativity. One of the most intriguing predictions is that when two black holes that are rotating at different speeds or are different sizes combine, the newly merged black hole receives a big kick due to conservation of momentum, pushing it out in random directions at velocities as high as 4,000 kilometers per second. “We used different assumptions for the initial black hole mass, for the range of stellar black hole masses within a globular cluster, and assumed that the spins and spin orientations were distributed randomly. With our most conservative assumptions, we found that, even if every globular cluster started out with an intermediate-sized black hole, only about 30 percent retain them through the merger epoch. With our least conservative assumptions, less than two percent of the globular clusters should contain intermediate mass black holes today,” she says. There are about 200 globular clusters in the Milky Way that may have already spawned intermediate-sized black holes, which means that hundreds of them would be wandering invisibly around the Milky Way. These could be engulfing the nebulae, stars and planets that are unfortunate enough to cross their paths, but apparently this poses no imminent danger to Earth—or at least not as far as anyone knows at this point in time. In addition the the rogue black holes, astronomers have discovered a new class of Jupiter-sized planets floating alone in the dark of space, away from the light of a star. The discovery team believes these lone worlds were probably ejected from developing planetary systems. The discovery is based on a joint Japan-New Zealand survey that scanned the center of the Milky Way galaxy during 2006 and 2007, revealing evidence for up to 10 free-floating planets roughly the mass of Jupiter, known as orphan planets. These newfound planets, located at an average approximate distance of 10,000 to 20,000 light-years from Earth, are difficult to spot, and had gone undetected until now. "Although free-floating planets have been predicted, they finally have been detected, holding major implications for planetary formation and evolution models," said Mario Perez, exoplanet program scientist at NASA Headquarters in Washington. The discovery indicates there are many more free-floating Jupiter-mass planets that can't be observed. The team estimates there are about twice as many of them as stars. In addition, these worlds are thought to be at least as common as planets that orbit stars. This would add up to hundreds of billions of lone planets in our Milky Way galaxy alone. "Our survey is like a population census," said David Bennett, a NASA and National Science Foundation from the University of Notre Dame. "We sampled a portion of the galaxy, and based on these data, can estimate overall numbers in the galaxy." The survey is not sensitive to planets smaller than Jupiter and Saturn, but theories suggest lower-mass planets like Earth should be ejected from their stars more often. As a result, they are thought to be more common than free-floating Jupiters. Previous observations spotted a handful of free-floating, planet-like objects within star-forming clusters, with masses three times that of Jupiter. But scientists suspect the gaseous bodies form more like stars than planets. These small, dim orbs, called brown dwarfs, grow from collapsing balls of gas and dust, but lack the mass to ignite their nuclear fuel and shine with starlight. It is thought the smallest brown dwarfs are approximately the size of large planets. On the other hand, it is likely that some planets are ejected from their early, turbulent solar systems, due to close gravitational encounters with other planets or stars. Without a star to circle, these planets would move through the galaxy as our sun and other stars do, in stable orbits around the galaxy's center. The discovery of 10 free-floating Jupiters supports the ejection scenario, though it's possible both mechanisms are at play. The observations cannot rule out the possibility that some of these planets may have very distant orbits around stars, but other research indicates Jupiter-mass planets in such distant orbits are rare.